Our world is facing an unprecedented humanitarian crisis with millions of refugees and immigrants fleeing persecution and violence. People living with fear and anxiety are becoming defensive and assuming extremist positions. 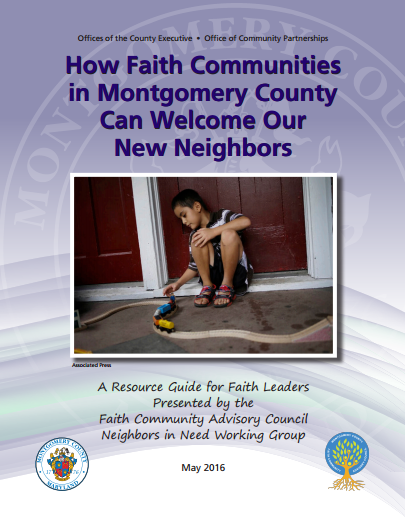 In response, we have developed this do-it-yourself guide for faith communities in Montgomery County to Welcome Our New Neighbors. 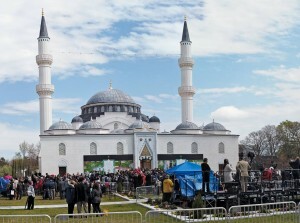 Here are ways people may connect with the heart of their faith, learn about the needs of their neighbors, and work with nonprofits and government agencies to make Montgomery County the most welcoming county in America. Guidelines for Respecting Religious Diversity includes many Board of Education policies and MCPS regulations and procedures that address issues of religious diversity, with feedback elicited from multiple stakeholders throughout both the faith community and MCPS. This is a historic document – never released before in Montgomery County – and perhaps the first in the nation of its kind. The collaboration between MCPS and FCWG is a great example of the Montgomery County Model in action, and highlights how successful community-led initiatives can build trust between various stakeholders in the community. Eric Treene, Special Counsel for Religious Discrimination in the United States Department of Justice presented at Know Your Rights! 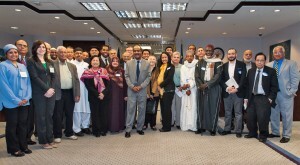 A Forum on Religious Land Use providing information on Faith Community Rights and Government Best Practices. Click each photo to view the full gallery for each event.